What a turnaround. The Packers Offensive Line should have been lambasted for their horrendous performance in week 3 on Monday Night Football, but they managed to get off (almost) for free thanks to the Inaccurate Reception that ended the game. Of course, their terrible game versus an admittedly inspired Seahawks DL did not escape our OLR analysis, and the Packers graded out as 28th in the NFL allowing 8 sacks in the game. 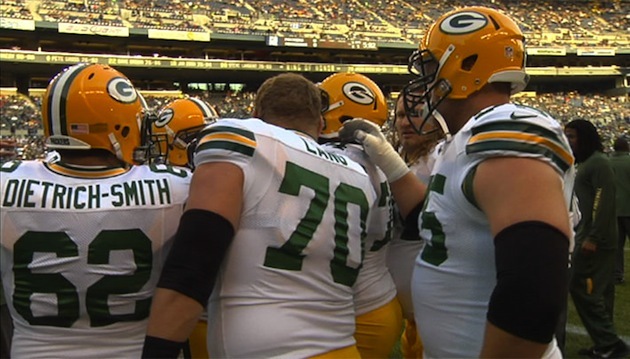 Cut to week 4, and there is a huge turnaround, with the Packers the NUMBER ONE offensive line unit in the NFL! How can this be? They've not ranked above 26th so far this entire season? The answer is simple, and they're down in the Bayou. That's right, it's all the Saints fault. Ok, maybe that's a little harsh, but certainly have something to answer to. In week 4, the Packers OL that had been so poor all year didn't allow a sack of Aaron Rodgers, didn't have a single negative yardage run, and rushed for a YPC of over 4.0 for the first time this season. When there's a change in fortunes this large in just one week, you have to look at the strength of the opposition straight away, and you can very quickly begin to see the Saints contributed to this OLR score as much as the Packers did. Aside from the Chiefs, who actually ran the ball very well in week 3 but allowed 3 sacks, all the Saints' opposition have ranked in the top 5 of OLR. Whether these offensive lines actually are amongst the best in the league when we finally grade them at the end of 2012 is yet to be seen, but the data so far certainly seems to indicate that playing against the New Orleans Saints gives O-Linemen an easy week. The other possibility for the Packers meteoric rise this week is that their previous 3 opponents have been very tough defensive units: 49ers, Bears and Seahawks. Each of these teams boast pro-bowl calibre pass rushers, and/or First Team All-Pro Linebackers, which undoubtedly makes for a tough day at the office. Either way, it's becoming more and more obvious that our OLR rating is going to need to be adjusted for opposition strength. In the coming weeks we'll be developing these defensive adjustments to give us a clearer pictures of which OL really is the best in the NFL so far this season. For now, however, it's the Packers that earn the week 4 title, and hence will take their place on our Facebook and Twitter banners for the next 7 days. Yeah, I'm going to talk about the Cardinals again. For the second week in a row, the Cardinals prop up the bottom of our OLR rankings, despite continuing their winning streak to go 4-0 this year. The truth is, this week there is just no excuse for the Cardinals. 1.78YPC, 8 sacks allowed, not a single rushing first down or touchdown. Now of course, the Miami front seven that they faced this week has had a good 2012 so far, and this will be accounted for when our defensive adjustments are introduced, but even against a team like the '85 Bears an OL should be able to do more than this. -1.292 represents the lowest OLR score for a team this season, and solidifies the Cardinals line as the worst in the NFL so far this year with 2 last place finishes, a 20th and a 12th. The Falcons also took a step backwards this week. Despite a great rushing game of 6.4YPC, they allowed 7 sacks in the game (3.5 to Charles Johnson), as well as a further 4 QB takedowns on Matt Ryan, which caused their score to plummet to 24th in the league at -0.413. The only undefeated team whose OL scored positively this week is the Texans. Although their run game was uncharacteristically slow, with a YPC of 3.1, they again did well overall, recording 5 rushing first downs, scoring a rushing TD, and not allowing a sack of Matt Schaub. With previous rankings of 18th, 3rd and 12th, the Texans are showing great consistency this season, and when we delve into the stats overall it'll be no surprise to see this 4-0 team firmly in the top 10. For more on our OLR rating system, check out our previous week by week analyses, which you'll find here. I believe the accepted name for last Monday night's game is actually the "Seattle Screwjob".